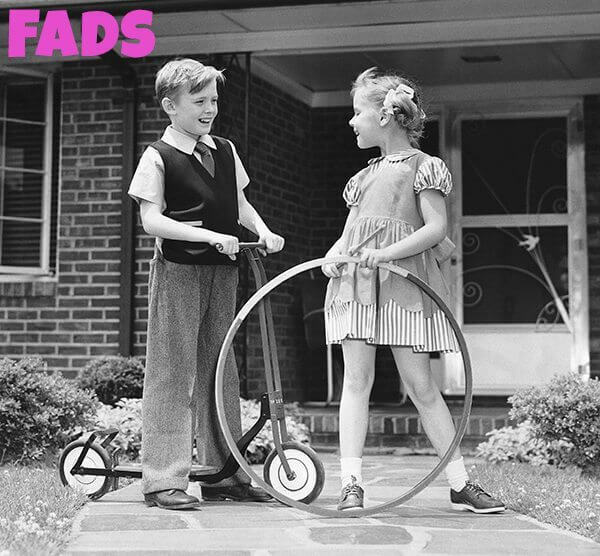 1950s Fads included this from Richard Knerr and Arthur “Spud” Melin, founders of the Wham-O Company, are the architects of the biggest fad of all time – the hula hoop! In 1957, an Australian visiting California told them, quite casually, that in his home country, children twirled bamboo hoops around their waists in gym class. Most of us would have thought, “how nice” but for Knerr and Melin an idea spawned. They understood how popular such an item could be and proceeded to manufacture one made of plastic, Marlex specifically, a lightweight but durable plastic then recently invented by Phillips Petroleum. The name “hula hoop” came from the Hawaiian dance its users seemed to imitate. Talk about sales! Wham-O sold 25 million hula hoops in two months. Almost 100 million international orders followed. They were manufacturing 20,000 hoops a day at the peak of popularity.